This beautiful coastal reserve stretches for 40 kilometres along the Cape's southern coast near Cape Infanta. Apart from the fantastic endemic fynbos, the reserve is home to many mammals. This beautiful coastal reserve stretches for 40 kilometres along the Cape's southern coast near Cape Infanta. Apart from the fantastic endemic fynbos, the reserve is home to many mammals such as the Cape mountain zebra, chacma baboon, eland, mountain reedbuck, grey rhebok, springbok, grysbok, common duiker, steenbok, Cape fox and small grey mongoose.Apparently there are also leopard and caracal, although they are rarely, if ever, seen. Twelve plant species are endemic to the Potberg, the range in the reserve, which is also home to the only breeding colony of Cape vultures in the Western Cape. At present there are 24 pairs in residence.Other birds to be seen are the black eagle, black shouldered kite and jackal buzzard. This reserve is also an excellent place from which to spot the many southern right whales that come into the region to calve during May to October each year. This has given rise to the opening of a whale trail along the coastline of the reserve.There are also a number of other great walks and trails through the reserve, and there is always the possibility of seeing a shy Cape clawless otter along the way. Although swimming off the beach is not always safe, it is fun to swim and snorkel in the rock pools.The reserve has a network of relatively easy trails for mountain bikes and a dedicated self-catering cottage with bike storage. 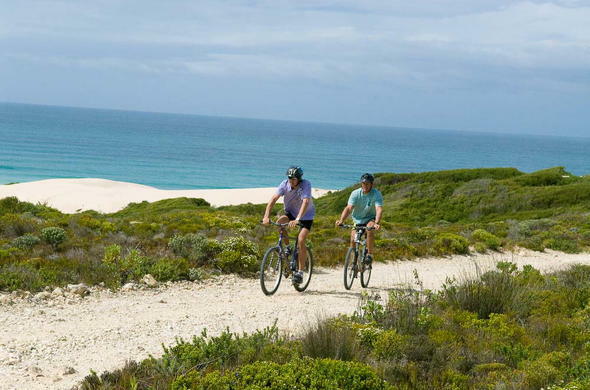 Accommodation in De Hoop is in the form of campsites, self-catering cottages, and a lodge, Lekkerwater, which is situated right on the beach.